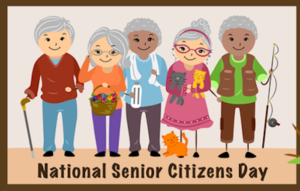 National Senior Citizens Day was created to give back to the seniors that have impacted our lives and those who have already given so much. Changing demographics due to improved healthcare have enabled our older citizens to contribute more years of productivity than ever before. This has allowed many to seek second careers and serve as role models for the younger generations. For all that they have done, we owe our seniors our thanks and gratitude. Back in 1988 former President Ronald Reagan was honoring seniors when he signed Proclamation 5847.